Background: *Waterlow and Sons originated from the business of James Waterlow, who began producing lithographic copies of legal documents at Birchin Lane in London in 1810. The company gradually grew; it began printing stamps in 1852, and Waterlow' sons Alfred, Walter, Sydney and Albert joined the business. James Waterlow died in 1876, and the company became a limited-liability company. In 1877, due to a family dispute, the company split, and Alfred and his sons formed Waterlow Bros. & Layton. The two companies later reunited in 1920. In the 1920’s and 1930’s the company was a major supplier of bank notes, stocks and bond certificates and postage stamps both in England and Internationally. They were based in London, Watford and Dunstable in England. Waterlow's was acquired by the printing and publishing company, Purnell and Sons in 1961. In turn Purnell sold Waterlow's banknotes, postage stamps, traveler's checks, and bonds printing arm to De La Rue. Device: Security device used on reference sheets kept in the company archives. Single die device. Strikes from the device are found in a variety of positions on the sheet on larger multiples and part sheets. 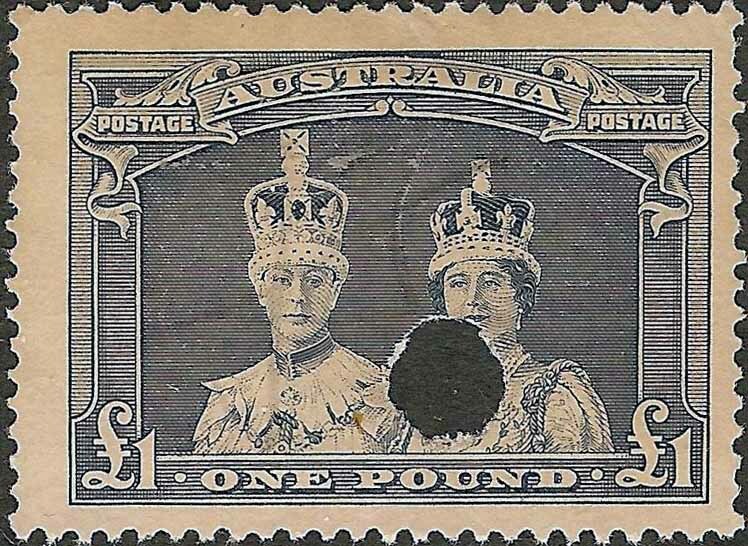 Engravers and Printers of Banknotes, Postage Stamps and Share Certificates. Address: 25-27 Farrington Rd, Holborn, U.K. Rarity Scale: ½d R4, 1c on ½d R4, 2c on 1d R4, 3c on 2d R4, 5c on 4d R4, 6c on 5d R4, 8c on 6d R4, 10c on 7d R4, 14c on 9d R4. Background: *The original company was established in the 1850s by Henry Bradbury and begin printing banknotes in 1856. Bradbury then died in 1860. In 1873–74, the firm built an imposing six-storey workshop, for engraving printing plates. In 1903, the company was acquired by the American Bank Note Company. In 1917, it moved to New Malden in Surrey still operating as Bradbury-Wilkinson as a wholly owned subsidiary of ABNC. 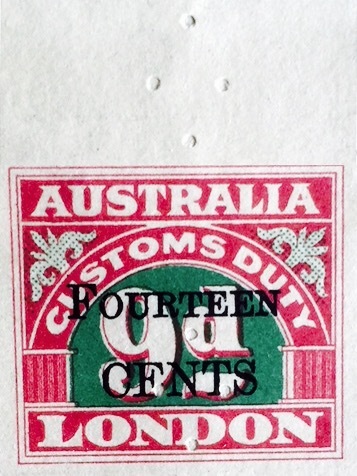 In 1986 it was acquired by De La Rue. The last Bradbury-Wilkinson plant was shut down by De La Rue in 1990. These nine recorded values correspond with the 23.10.23 printing records as a first printing order for this company of these issues. Background: *The Australian Patent Office was formed in 1904, and it took over the role of government involvement in the protection of Australia's innovation that had previously been undertaken by the Australian States through individual State registers of trade marks, patents and copyright. The Patent Office was originally located in Melbourne with responsibility for patent registration and rights. Later in 1933 they expanded to also cover trade marks and designs systems and at this time they began migrating to the newly formed federal capital, Canberra. 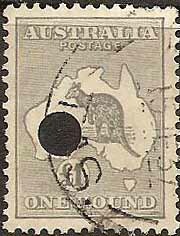 As of 1998 the Patent Office changed its name to IP Australia. IP stands for Intellectual Property. Device: Single die device that was used to date stamp the Patent document. 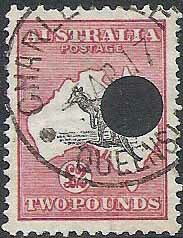 Stamps sometimes got in the way and were cancelled. This form of document cancelling was discontinued c1978. The below Bulk Postage Punch's and Telegraph Punch Holes are beyond the scope of this publication and are only shown here for completeness. 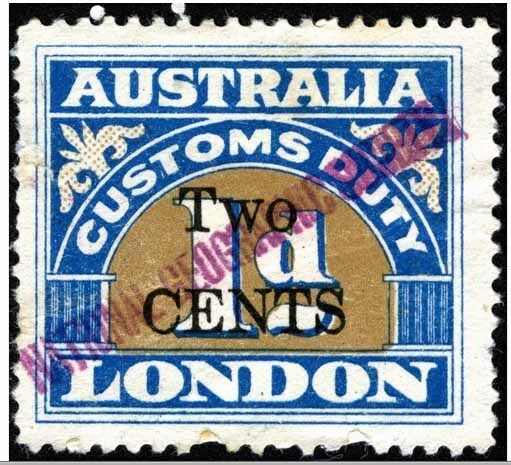 1929 issue 1c on ½d, 2c on 1d, 3c on 2d, 4c on 3c, 5c on 4d, 6c on 5d. 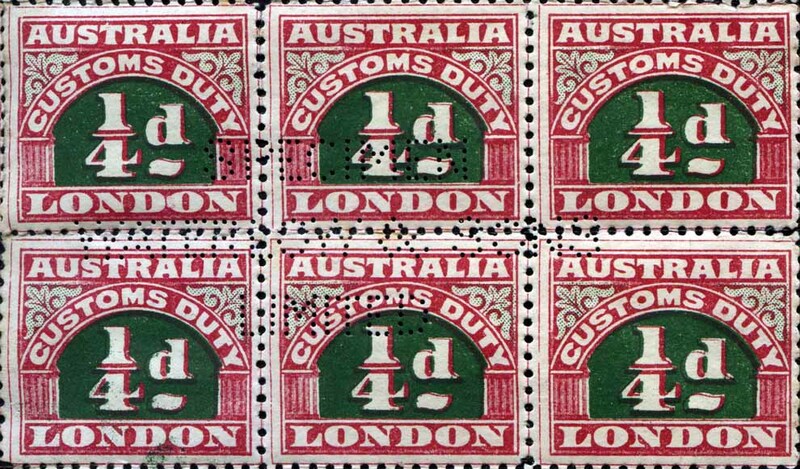 1929 issue 1c on ½d R1, 2c on 1d R4, 3c on 2d R3, 4c on 3c R3, 5c on 4d R4, 6c on 5d R4. Background: *The National Geographic Society was formed and incorporated in Washington, D.C., USA, in January 1888, as a club for an elite group of 33 academics and wealthy patrons interested in travel. The National Geographic Society's initial mission was "to increase and diffuse geographic knowledge” but later it was expanded to include, “while promoting the conservation of the world's cultural, historical, and natural resources.” The Society is governed by a Board of Trustees whose 22 members include distinguished educators, business executives, former government officials, and conservationists. The Society sponsors and funds scientific research and exploration and publishes an official journal, the “National Geographic Magazine” in 34 languages. They also publish other magazines, books, school products, maps, other publications, and web and film products in numerous languages and countries. Its educational foundation gives grants to education organizations and individuals to improve geography education. As of 2013 the Society’s various media activities reach about 360 million people monthly.